Wow is dark rock ever popular nowadays!! Its a nice start Honda , HEY I have a civic !! LOL nice name. It's popular cause it's so good looking! That's a sharp tank, honda. Is that slab of rock balanced on the driftwood? It looks like it's floating but then pictures always look really dark on my monitor and I didn't even see your driftwood until I looked closer to see what the rock was sitting on. I would love to get some nice looking rock like that for one or both of my tanks. Is it secure in there though? 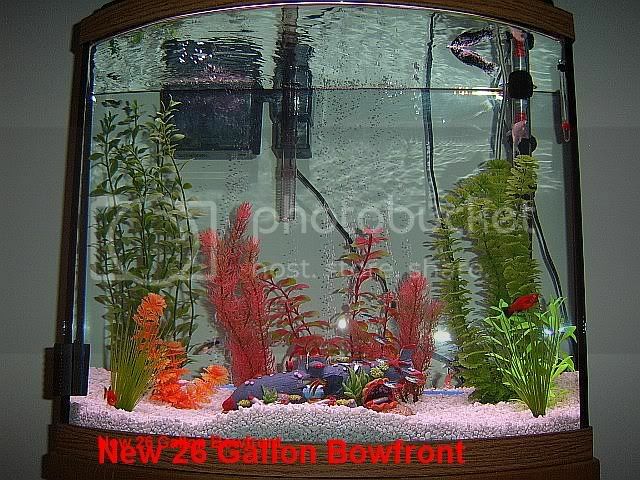 Not gonna fall over and damage your tank bottom or your fish? Well the rock is just balenced there but balenced really good its not going to fall off and what sword are you talking about the one in the middle thats a giant anubius its huge just wondring what you ment?? I think you should move that rock from above the driftwood to the gravel. Nature usually doesn't deposit large rocks on top of wood! Just some constructive advice! I'm trying to sink my driftwood thats what is holding it down so as soon as it sinks I will take the rock out!!! What substrate is that? I can see why the black colored bottoms are becoming so common. There are so many different aquascaping possibilities with it as everything put on top like rocks, driftwood, stones stick out so good. 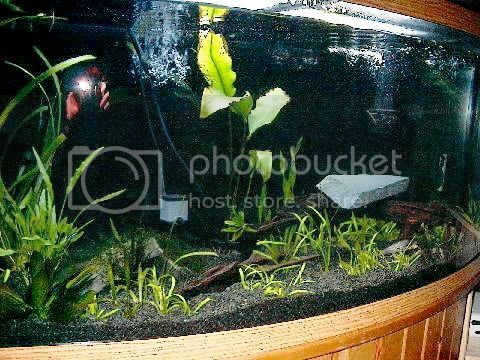 Its Eco Complete substrate it looks really nice and you are right coryfan there is a lot of differnt ways you can do a aquascape with black substrate just never really thoght about it. I was going to say the same thing, LOL. 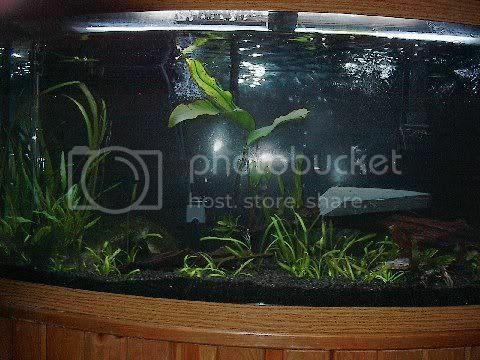 Wouldn't want it falling and somehow doing damage to your tank or even an innoscent little fish. Very dark, I like it a lot. Mines just the opposite, I went with white pebbles for a much brighter theme.